Sweet moogley googley – what a mouthful. Being able to rattle off the name of this treat to the product ordering manager of your neighborhood supermarket or favorite mom and pop shop without referencing a cheat sheet is highly unlikely, so be sure to tuck a tangible reminder somewhere safe. By the end of this review, youâ€™re going to need it. (Other sites refer to it as “Amy’s CRISPY Organic Candy Bar”). Amyâ€™s should ring a bell with fans of natural and organic convenience foods, snacks, and pantry staples due to their 25 year run as a wholesome eats purveyor. Right. That Amyâ€™s. Now theyâ€™ve extended their higher quality, minimally processed credo to the candy biz, which is a huge plus for lovers of sweet midday nibbles. It seems like your basic caramel has become a thing of the past. 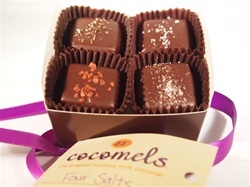 Everywhere I look there are all kinds of fancy caramels topped with special salt from Hawaii or the Himalayas. Iâ€™ve also seen flavored caramels like pumpkin or even varieties made with tea. 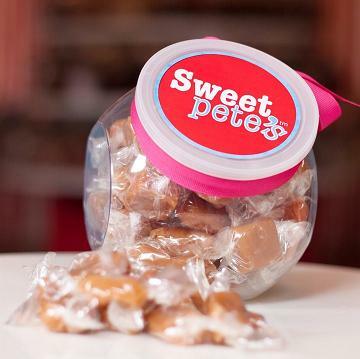 Iâ€™ve actually never really wanted to try any of these new fangled caramels but after trying these sea salt caramels from Sweet Peteâ€™s, Iâ€™ve developed a new point of view. Keeping tabs on the latest nutritional studies and headlines is always a thrill a minute (especially if you pride yourself on eating a relatively healthy diet) because once seemingly wholesome dietary staples will inevitably be kicked to the curb in favor of their far more artery-worthy cousins. 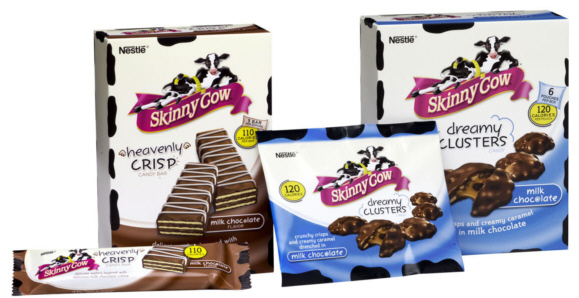 Skinny Cow ice cream has been around for a while and I think it’s pretty darn good so I was curious as to how their new line of candies would taste. The Skinny Cow candies are made by Nestle so I figure that Iâ€™d find some similarities in taste and quality to those Nestle candies I already like. The idea is that these are calorie-counted candies so that you know how much you are eating in one sitting. World Market is a store that sells a variety of imported goodies, from home decor to gifts and snacks. They also have a great candy section that includes imported candy as well as their own line of chocolate. 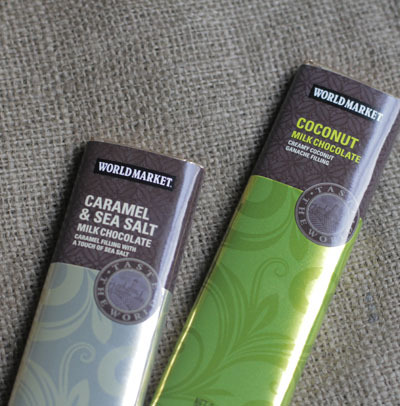 A while back, we reviewed World Market house chocolate bars. Today, I picked up two of their house line of filled chocolate bars to try out: Coconut Milk Chocolate and Caramel and Sea Salt Milk Chocolate. Both of them sound good to me!